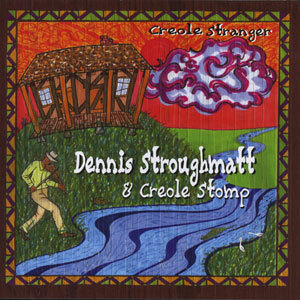 Dennis Stroughmatt and Creole Stomp is a nationally touring Creole, Cajun, and Zydeco band bringing the best in Louisiana French music and culture to audiences of listeners and dancers across the USA and Canada. Formed and led by French speaking Cajun/Creole Accordionist and Fiddler Dennis Stroughmatt, Creole Stomp is striving to not only entertain, but also to educate audiences about American French culture. Having lived in Louisiana and Quebec, Canada (and still touring with many Louisiana based Cajun and Creole-Zydeco bands in and out of Louisiana on occasion), Dennis only knows how to play it “downhome” and always has a sound that is fresh and “straight from the bayous and prairies” of southwest Louisiana. The Creole Stomp sound pulls from many influences but is noted for a style similar to the famed Ardoin Family Band and The Lawtell Playboys. Dennis and Creole Stomp have been seen and heard on radio and television with PBS-TV, WGN-TV, NPR’s “Prairie Home Companion with Garrison Keilor,” CNN’s “World Beat” on Mardi Gras, and on many stages including the Illinois State Fair, “The Louisiana Folklife Festival,” the “Big Spring Jam” in Huntsville AL, the St. Louis Soulard Mardi Gras, “The Cajun French Music Awards” in Lafayette, LA, and “Mardi Gras World” in New Orleans, LA. 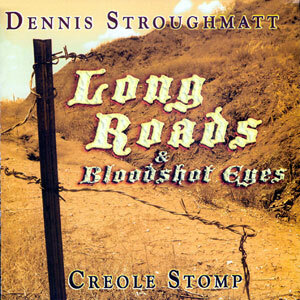 The new CD by Dennis Stroughmatt and Creole Stomp “Enfin…At Last” was nominated “Best Album” by a Cajun/Creole band based outside of Louisiana by the Cajun French Music Association for 2003. Members of Creole Stomp include Jon Watson on drums, Robert Russell on lead guitar, Jim Willgoose on bass, and Jennifer Stroughmatt (the resident French Acadian of Creole Stomp) on Rub-board and Triangle. The mixture of these fantastic and experienced musicians creates a talent gumbo that is almost unstoppable with an ability to play a wide range of Louisiana French music not often heard from strictly Cajun or Zydeco bands. Don’t miss hearing a band that plays Creole to the core and often dives into “old school” Zydeco…the only one based north of Eunice LA. Somehow, all of life’s joys and bitter sweetness get seemingly compressed into the rough-cut gems that are Creole accordion-fiddle tunes. Take the legendary duo of “Bois Sec” Ardoin and Canray Fontenot, whose squeeze-and-saw attack could alone do more emotionally than full bands could muster with all of the additional horsepower. That famed team, however, belongs to the ages. Thankfully then, at age 70, Morris Ardoin is still mining those rustic diamonds, just like his father did. And having hooked up in collaboration with fiddler/vocalist Dennis Stroughmatt, a similar two-man rapport is developing. At long last, Le Tracas de Morris is viable, danceable proof. They immediately engage, like sparring serpents – twisting, turning, entwining, looping, and re-looping around each other’s lines. It’s all in the moment too, with Morris calling audibles right there on the line behind his heaving accordion, flashing his partner the “go” sign for flying off on another solo. Their French hollers manage to squeeze out some extra mourn for a blues or stretch for that added shot of fire on a two-step. Sometimes the clang of a triangle will chime along, and the acoustic chop of guitar makes frequent rhythmic accompaniment. Yet it’s the Ardoin-Stroughmatt engine that throws the sparks from “Le Blues a Whiskey” until finally flickering out on the wheezy vamp through the “Bars Of the Prison’s” first gear grind. There’s a whole neo-traditional camp of young bloods who painstakingly study and strive to achieve for what passes as something so naturally effortless as breathing for Mister Morris. Cut after cut crystallizes into an instant party – without ever intentionally trying. Left to his own devices, Dennis Stroughmatt tends to refurbish old Creole and Cajun tunes with a fresh coat of paint and some updated bodywork. So Amede Ardoin’s age-old “Blues a Basile” gets massively inflated into something worthy of any booming dancehall. Nathan Abshire’s newly redesigned “Bayou Teche Blues” cranks over well. “Suzy Q” shoves along with tremendous new-found momentum beyond Boozoo Chavis’ original means. Even the blues standard “Baby Please Don’t Go” becomes re-colored in murkier, spookier shades than Big Joe Williams could have dreamed. But the Illinois native can also solidly build his own compositions from traditional and contemporary parts. Both a snaking “Morris Ardoin Blues” tribute and the mood piece which lurks somewhere ’round midnight, “Creole Stranger”, confirm that. To make it all happen, Stroughmatt himself pulls double duty on both lead accordion and fiddle in his forward-thinking crew, Creole Stomp. Electric guitars slide, slur, peck, and twang. Big basslines go bump through the night. And, for added oomph, both drumkit and a tireless rubboard provide double-barreled kick. There’s no shortage of power or drive for their debut collective work. That’s made especially evident when barren songs introductions literally explode behind the punch of a band in full roar. Clifton Chenier’s “I’m Coming Home” and the swamp-pop ballad treatment of “This Burning Desire” finally afford dancers the greatest chance to catch a breather and nuzzle close. 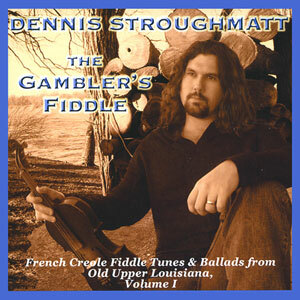 Dennis Stroughmatt is a fiddler/accordionist/singer who leads two groups. Creole Stomp plays mostly Cajun and Zydeco music, while Esprit Creole specializes in French Creole fiddle tunes and ballads from Old Upper Louisiana (the Missouri-Illinois region). Long Roads and Bloodshot Eyes, his third album for Swallow, features the former group but also points to a new direction for Stroughmatt in the sense that the album contains largely original material. The exceptions are Fats Domino’s “Good Hearted Man,” Boozoo Chavis’ “Johnny Billy Goat,” Dewey Balfa’s “Parlez nous a boire,” and a couple of Morris Ardoin tunes. Also, unlike his previous albums, nearly half the material on this album is sung in English. The album closes with a cover of Johnny Paycheck’s “Apartment #9,” a track that demonstrates that Stroughmatt’s versatility extends to Country music. It’s a pretty safe bet that this is the only review you’ll read today for an album of music inspired by early French Creole settlers in an area of Southern Illinois and Missouri once known as Upper Louisiana. 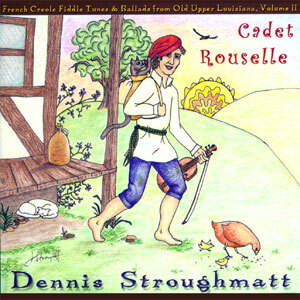 Cadet Rouselle, newly issued on the Swallow Records label, is the latest musical expression from Dennis Stroughmatt, who has spent years bringing the sounds of early Americana – especially that with a French twist – to listeners. Stroughmatt is a well-known and highly respected musician who has performed regionally and nationally with his group, Creole Stomp, entertaining audiences with some outstanding swamp music in all varieties. But even though he’s completely at home with Cajun and Zydeco, this album follows up on 2006’s Gambler’s Fiddle, and continues his quest to recognize the music of early French settlers in his home area of Upper Louisiana. He’s joined by his wife Jennifer, who is a skilled multi-instrumentalist and singer herself, and several other accomplished musicians. Included among them is bassist Bob Krumm and banjoist Jon Watson, both from Creole Stomp. The music itself is often reminiscent of – and in some cases, nearly identical to – Cajun music, and shares many of the same characteristics, so fans of that genre will find the album very listenable. Some of the tracks are a little different though, with a soft and lilting sound that might give the listener something new to experience. 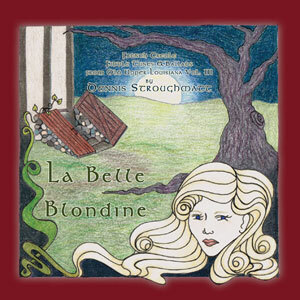 A good example is “Isabeau se Promene,” which sounds almost like a medieval ballad from the old country, and “Marie Madeleine,” a piece that features some especially nice vocals by Stroughmatt. Singing in French, he is obviously at home with the music and his strong, reedy but confident voice rings true. Some of the livelier pieces are more reminiscent of Cajun music, but there’s certainly nothing wrong with that — Stroughmatt and his band thrive on that type of music. Especially enjoyable were “Les prisons de Nantes,” and “La pommier d’un Ange,” an instrumental that features a strong lead from the star’s fiddle.